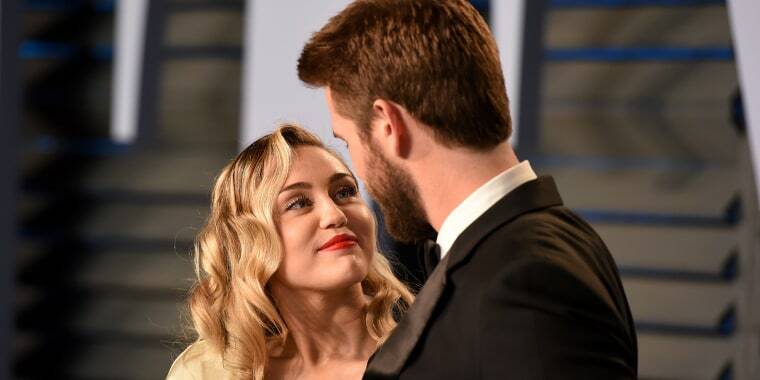 From the way he looks at his family to the way he leaves his socks around, there's not one thing Miley Cyrus doesn't celebrate about her partner. Just three weeks after Miley Cyrus and Liam Hemsworth said "I do," the newlyweds had something else to celebrate — his birthday. The actor turned 29 over the weekend, and on Sunday night, Cyrus had something to say about that on social media. In an epic post that's part love letter, part love list, the pop star sang her "favorite dude's" praises. "The way you look at me, the way you look at our dogs, our pigs, our horses, our cats, our fish," she wrote. "The way you look at your family … Your friends … At strangers … At life. The way you look at the ocean and the way you always take your time. The way you go outside when I ask ‘what’s the weather like?’ instead of checking your phone." And she was just getting started with her "favorite things" about him. "The look on your face when you receive good news and how you look AT the bad news," she continued. "I love how you always try things your way, but are never (too) proud to ask for help. (Yes, I’ve noticed and taken note, I’m a work in progress). The way you paint, the colors you choose …"
The 26-year-old noted how much she loved watching "The Sandlot" with him, the new music he introduces her to, his laugh lines, the way they speak their own language and she even loves finding his dirty socks on the floor ("cause that means YOU'RE HOME"). In fact, it seems that since meeting him on the set of the movie "The Last Song" a decade ago, there's not much he's done that she doesn't love. For instance, when he shrinks her favorite T-shirt in the dryer, to her, that's just another reminder of how great he really is. "Having a boyfriend (oh em gee I almost forgot you’re my friggen husband now) that does laundry is pretty much the best thing ever," she wrote. But amid the long list of reasons to love him "unconditionally," Cyrus highlighted the most important part of their bond: "I respect you and you respect me." She then signed off, thanking her groom "for giving me the happiest days of my life."